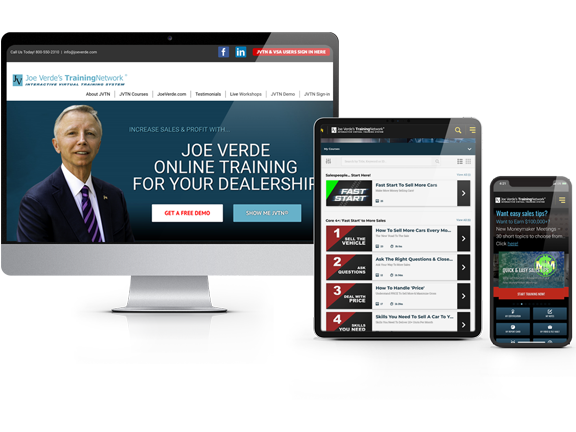 Automotive Online Sales & Management Training | Joe Verde Automotive Sales & Management Training, Inc.
Sell More Cars, Have More Fun and Make More Money. $156,000 my first year selling cars! "Joe, it's been one year since I stepped off the oil fields and into the car business. Thank you and thanks to my store for believing in the value of your training. 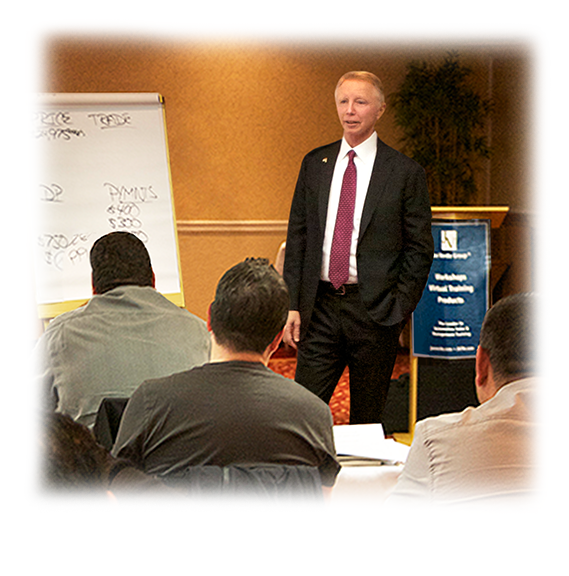 I focused on the Core 4 Selling Skills on JVTN® for the first 2 weeks of my training. I was relentless in my pursuit to get better and took over 100 chapters in that time frame, and I continue to train daily. If it wasn't for JVTN® and your new basics selling process, I wouldn't be able to continually sharpen my skills, increase my units, and my income. With JVTN® I went from 8 cars to 10 to 13 to 16 and then to my best month at 20 units after attending your closing and negotiation workshop. Joe, I was #5 in units in our group of 15 stores. I was #1 in gross and I doubled the gross of #2. You truly have taught me how to work smarter not harder, my customers love me, my deals are easier, and the sky is the limit!" 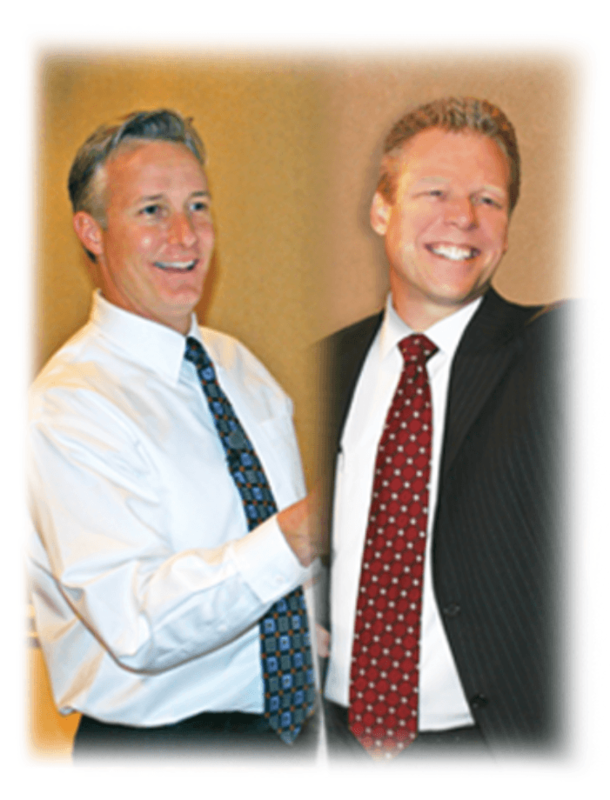 "We have been on Joe Verde Training for about 5 years now. We sent our managers to the Manager's Workshop and our sales team to the Sales Workshop, and we hold JVTN® group training 2-3x per week. It has been the best decision we have made yet. Joe, we started out selling about 80 units then we moved to 100, and then 120 units. And we just had one of our biggest months to date and sold 144 units, and just about doubled our gross profit. We just attended your Manager's Workshop again, and it reminded us of how much true potential is still sitting in our dealership. The best part is, with just a few changes and improvements in a few areas, we can continue on this incredible growth track. Thanks for a great program that not only helps us sell more cars, have more fun and make more money - following your processes makes my job easier by making my sales team better, makes the deals easier to work, and gives us even happier customers and greater CSI." With my new tools - I've doubled my sales and tripled my income. "Joe - I'd been a service technician for the past 2 years. As a tech, my tools were everything to me because having the right tools for the job made my work much easier and more profitable for the dealership. I have been selling cars a quick 6 months. I was selling about 6 a month, but I knew there was so much more out there for me if I just had the right tools. After attending your workshop, I realized my words are my tools, so I upgraded my selling tool box with the right words in sales, and with your New Basics I have a clear, easy to follow plan for success with every customer. I slowed down, I stay off price now to build more value, and I get as many yeses (to confirm the benefits) as I can. The changes I've made since your class have been incredible. I just had my best month ever, I sold 15 cars, tripled my earnings and my customers love me! My goal now is to double my earnings from when I was a tech, and thanks to your program, I'm off to a great start!" I'm on my way to $100K my first year! "I have been in the car business 8 months and was a solid 11 units a month but was always striving for more. When I left your How To Sell A Car workshop I believed your New Basics were the Key to my success, and they are! I do my 20-20-20 every day and I treat everyone like a buyer today. I focus on their hot buttons, get more minor commitments (yesses) than I thought was possible and I follow all of the steps, 100% of the time. My deals were easier, my customers loved me, and I was amazed how just making some small changes in my presentation could yield such incredible results! After your sales workshop my sales have gone up and up and my new 90-day average is 18 units and I more than doubled my earnings per month in the middle of winter in Canada. And your ‘go to work to work' audio is a must for anyone who wants to grow. I am here to be a success!" "Joe, I have been selling cars for about 1 year. My average was 12 units before attending your How To Sell A Car Workshop. After the workshop, my confidence was way up and I committed working on my selling skills and decided to believe that everybody came to buy. I started following your sales process 100% of the time, and asking for the sale 100% of the time and my results have been huge! I attended the class is August and ended up with 30.5 that month and now my 90 days average is 25 units per month. I sold 75 units in the last 3 months, which is 39 more than I averaged in the 3 months before class. I just can't thank you enough for giving me the information I needed to become a true sales professional"
From 5-6 a month to $100,000 a year after your books and your 3 Sales Workshops. "Joe - we haven't met, but you've had a profound effect on my life and my career. I started off as a ‘great average salesperson' selling 5-6 cars a month, but after going to all your Sales Workshops and reading your books, I'm now making over $100,000 a year! I close 17-20 units every month, and I've become a gross holding, upwardly professional salesperson. Knowledge is power, and I learned so much in your class. When I get objections, I acknowledge them and then Clarify, Rephrase, Isolate and Close (CRIC) and just keep going. It's so easy now - I go to work to work, plan my day, set goals and I'm making it all happen. Thank you Joe, and all of your staff for helping me gain the skills and confidence I needed in sales!" "Hello Joe, I just wanted to take a minute to say thanks for another Incredible Year. As a group, the Murray group believes in training 100% and last year we were up 30% in new car sales and our used car sales were up 53%. We send all of our managers to the managers and sales workshops and all salespeople to the sales workshops and most have been to the Closing and Negotiation workshop as well. Many of them have been multiple times. Why? Because it just plain works. You can never stop learning and you have to keep evolving if you want to stay ahead of the competition. 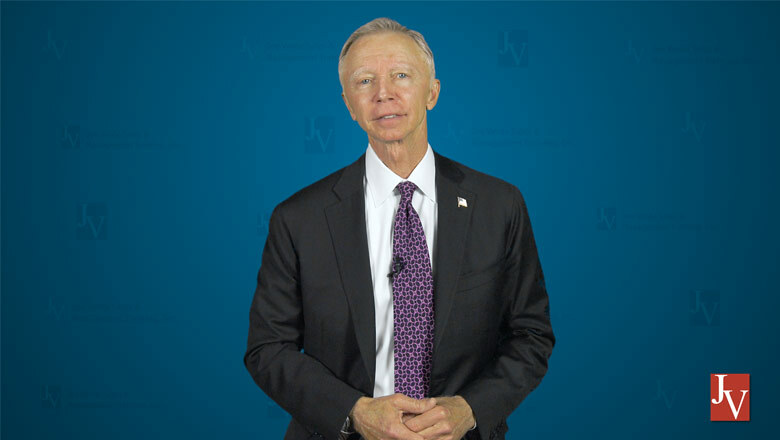 The consistency of the message when going through your New Basics sales process is what everyone needs to stay on track and keep growing, and JVTN® provides that to myself and my team to always keep us fresh and always gives me new topics to train on. I recently attended your Train The Trainer workshop, and I've got to say it really got me out of my comfort zone and changed my perspective on what effective training really looks like. After that class, I now approach my meetings with a solid plan, and I understand that if I want to get them excited about any topic we cover, I need to tune in to their station (What's In It For Them), and if my training doesn't include the ‘how to', it's of no value to them. My meetings have gotten easier, they have been way more effective and the involvement during the meetings has gone up 10-fold. My salespeople are having more fun, closing more deals and making more money and most importantly - more and more of our customers are happy! Thanks again for providing everything a dealership needs to be a success in today's ever-changing market!" "When I left your Trainer Training Workshop I was on fire and had a plan! The skills I picked up at the workshop turned me into a training machine. We started training M-W-F on JVTN® and we used your Leaders Guide, Workbooks and your Meeting Planner, exactly as you recommend. You made the workshop a negative free zone, and I did the same in our meetings, which was a bit of challenge at first, then the benefits of training started kicking in quickly. I wanted to train, they wanted to learn and we were all growing more and more after each training meeting. I really saw how important it was and that it was working when at the end of the month, I'd try to postpone training and the sales team would revolt and demand we hold training. 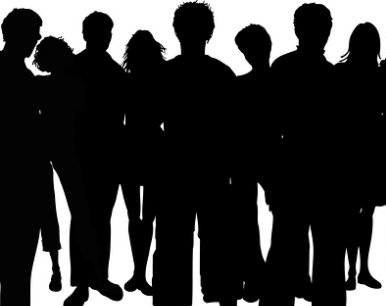 Joe, this training has made such an incredible change in our attitudes and in our culture. And by the way...we added an additional $700 in gross per unit in our very first month of implementing your training after the workshop." Use these calculators to find your ad costs, your sales potential, find what % of improvement you need to double your net profit, and just about any other "what if" calculation you'd like to make. 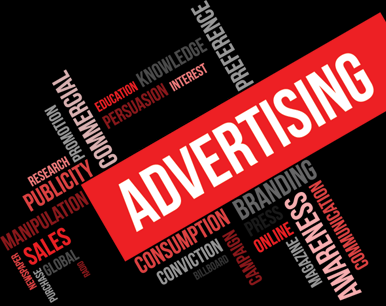 Most of us were taught to find our advertising costs per unit by using a very bad formula. We were told to divide our total ad expenses by our total number of sales instead of dividing our total ad expenses by only our ad-generated sales. Wish you could sell more? Have you ever thought about what it would be worth to you long-term? 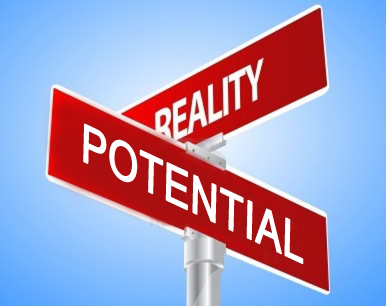 Take 60 seconds to evaluate your potential and find out what it's worth for you to improve. COULD YOU SELL MORE IF YOU HAD MORE FLOOR TRAFFIC? WHAT WOULD THAT MEAN TO YOUR PROFITS AND PAYCHECK LONG-TERM? TAKE A MINUTE TO EVALUATE YOUR POTENTIAL AND SEE WHAT IT'S WORTH TO IMPROVE. Why Train With Joe Verde? 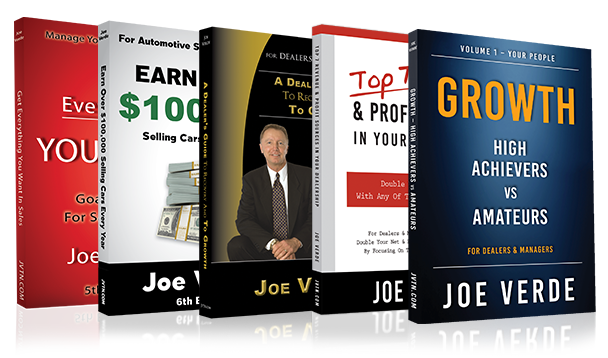 Joe Verde is the industry leader in sales & management training...Take your dealership to the next level in unit sales, gross profit and CSI when you partner with Joe. WANNA GET TO THE NEXT LEVEL?